It's been nearly a year since owner/brewmaster Matt Ehinger let it be known that he intended to open Bitter Sister Brewery in the City of Addison. Originally planning to open in late summer 2014, it's taken a little longer than expected for the project to come to fruition, but Ehinger says he's just a few finishing touches away from being ready for the brewery's soft opening this weekend. Commenting on what it took to finally get to this point, Ehinger can't single out anything specific that led to the extended timeline, it was simply a matter of working through the process. While the bulk of the brewing equipment arrived in May of last year, construction didn't begin until September due to delays in obtaining a building permit. Add to that having to work around the holiday season, and it's easy to understand how the finish line became more of a moving target. 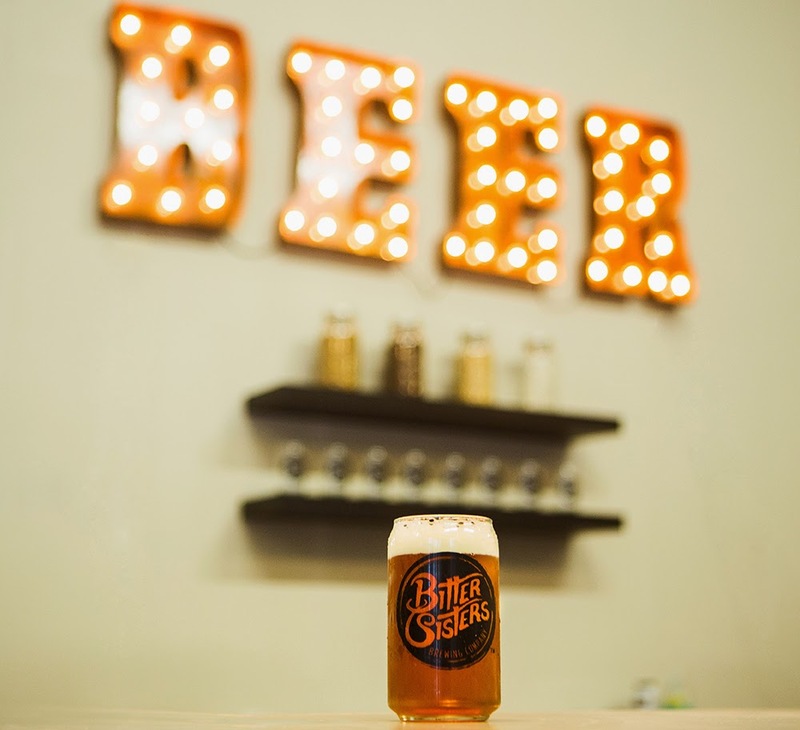 Now brewing full-time, Bitter Sisters becomes only the second packaging brewery to exist in Addison, and the city's fifth brewing operation overall. It follows Humperdinks, which no longer brews at the Addison location, and now-closed names from the past like the Addison Brewing Company (1989) , Hoffbrau Steaks and Brewery (1995-2001) and the Rock Bottom Restaurant and Brewery (1995-2001). Based on that, in some ways you might say that Bitter Sisters is looking to succeed where others have failed. The market was different back then, though, as Ehinger himself can attest based on his own experience brewing professionally in Oklahoma during the late 1990s. As for the here and now, the family-run business named after Ehinger's wife and her two sisters occupies an 8,500 square foot space on the northeast corner of Surveyor Boulevard and Belt Line Road. You'd never guess the size of place based on the view from the parking lot, but there is more than enough room to move around. The production area takes up about 7,000 square feet, giving Ehinger the ability to at least double and perhaps as much as triple his current capacity in the future. At present, he's working off of a thirty-barrel brewing system, with fermenters both inside and out of cold storage in order to implement his plan to brew a lineup evenly split between ales and lagers. On why he's looking to make lagers a focal point of his portfolio, Ehinger explains that it mostly has to do with the recognition of fact that this is Texas, and Texans have traditionally liked a certain type of beer. Part of it has to do with the climate, of course, and wanting to have a stable of light-bodied brews available for warm weather drinking, but at the same time he's thought about certain cultural aspects as well. In particular, he references early Czech and German settlers who brought their lager beer recipes with them as they immigrated largely to the central portions of the state. In other words, Texans have been drinking lagers for well over a hundred years, and old traditions die hard. Whichever your prefer, Ehinger plans to have as many as eight beers pouring in the taproom, with selections comprised of year-round staples, quarterly seasonals and brewery exclusives. As of now, he's got three beers ready to go, each of which will be a Bitter Sisters standard going forward. Included among these is Busy Body Blonde Lager (5.9% ABV), a clean and slightly sweet Munich-style Helles, and Cat Fight IPA (6.7% ABV), a classic take on craft beer's most popular style which puts more emphasis on hop flavor and aroma than it does on overall bitterness. Then there's Knock Out Irish Red (8.1% ABV), a beer which is "imperial" in nature, but much different than what you might expect given other imperial reds around town. Brewed with an infusion of chocolate malt, it's a dark and malty beer with a chewy palate and enough underlying warmth that it's probably more of a sipper than is typical for the style. Looking ahead, Ehinger plans to have a limited barrel program, likely opting for something other than bourbon casks short-term given that they are getting more difficult to obtain. He's leaning towards using rum barrels as of now, perhaps to give a beer like Knock Out a little added punch. As for packaging, a canning line is in the long-term plan, but he sees such an addition to be at least a year down the road. For now, he's focused on establishing his brand and his beers in and around the North Texas craft beer community. Beginning on Saturday, March 28, the taproom at Bitter Sisters will be open weekly from 11 a.m. - 3 p.m., with tours at 1 and 2 p.m. Evening hours on weekdays will be set sometime in the not-too-distant future. In addition, in the coming days you'll also be able to find the brewery's beers at the Addison Flying Saucer, Craft and Growler, Londoner Frisco, Lone Star Taps & Caps, Pie 314 and LUCK.